Smiles were plentiful this past Saturday as Colleagues members gathered as co-creators…a hallmark of our group through the years. As we experienced the joy of working together on a labor of love, we learned some new possibilities for future design projects! Cranes of Hope facilitator Jeanne Reeve shared her cancer survivor story which included the subject of senbazuru. This ancient Japanese tradition promises long life or recovery from illness to the person who folds 1000 origami cranes. Sometimes cranes are folded by family members and friends on behalf of the one who is in need of wellness. During Jeanne’s healing journey, she decided to embrace this tradition with a slight modification. Already an artist trading card enthusiast, she began to incorporate folded cranes into her trading cards, and shared them with other patients and survivors of cancer. Other cancer survivors, champions and caregivers joined her, and soon, baskets of crane cards began to appear in Minnesota hospitals where patients could choose a card for themselves that held special meaning and encouragement. 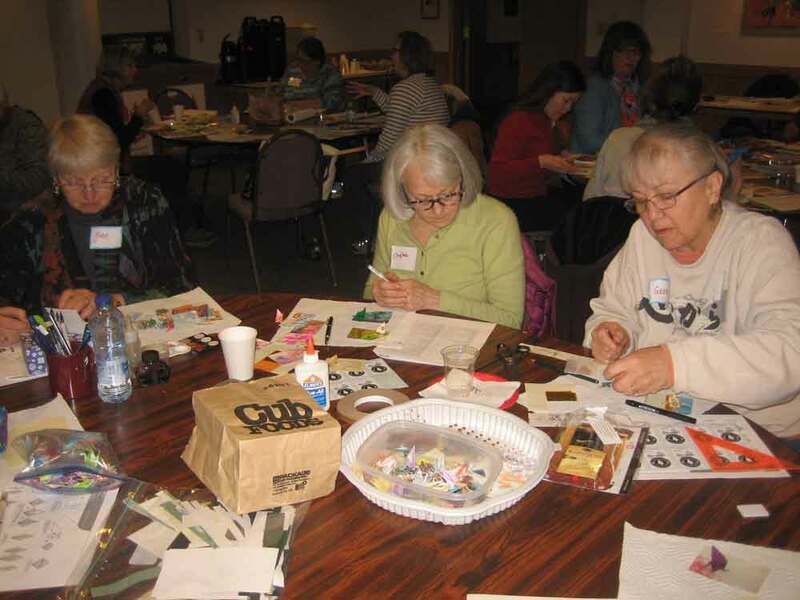 Cranes of Hope in Minnesota is a fast-growing group with greatly increased monthly card-making sessions in various Twin Cities locations. Jeanne brought a team of volunteers with her for our day of card-making. After sharing her story, they helped us with possibilities as we worked. Each table was overflowing with tools and materials, all pre-packaged and assembled by member, Lynn Ohlhorst. Color was the watchword of the day as we produced 300 Cranes of Hope artist trading cards to be given to cancer patients at local hospitals and health care facilities. Each finished card sported a small origami crane, and a handwritten inspirational message. At the end of our session, we donated more than 1100 card backgrounds and numerous collage scraps for future use by Cranes of Hope volunteers. Many thanks to facilitators Lynn Ohlhorst and Phyllis Stratman for all their work coordinating the program and logistics related to making it a successful afternoon. Also, please feel free to send us any images you may have from the day to images@colleaguesofcalligraphy.com and put “Cranes of Hope photos” in the subject line.